The Rubro-Negra have the top two highest grossing football (soccer) games of the year so far, but São Paulo teams dominate the rest of the top ten. RIO DE JANEIRO, BRAZIL – According to the latest sales figures for the sixty Brazilian football (soccer) teams that compete in Series A, B, and C of the Campeonato Brasileiro, Rio’s CR Flamengo has the distinction of having the two highest grossing games of 2017 so far. Widely considered Brazil’s most popular football club, Flamengo has the top two highest grossing football (soccer) games of the year so far, photo courtesy of CR Flamengo. The top grossing game of the year so far was the March 8th Copa Libertadores match between Flamengo and San Lorenzo, won by Flamengo 4-0. 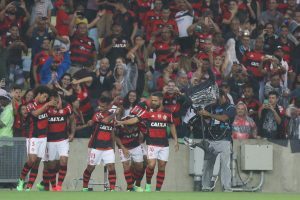 The match, Flamengo’s first of the year on its home turf of Maracanã, earned R$3.69 million with an average ticket price of R$68. In second place, the Rubro-Negra‘s April 12th 2-1 win over Atlético-PR, also in the Copa Libertadores and again in Maracanã, earned R$3.33 million with an average ticket price of R$62. Despite Rio de Janeiro owning the top two spots, São Paulo would dominate the remainder of the top ten, with teams from Brazil’s financial capital making up the next six highest earning games. The third and fourth highest grossing games were played just last weekend in the semi-finals of the Campeonato Paulista. Palmeiras‘ 1-0 win over Ponte Preta at Allianz Parque on April 22nd drew R$2.91 million with an average ticket price of R$74. The other semi-final match in the Campeonato Paulista, on April 23rd, a 1-1 draw between the Corinthians and São Paulo at the Corinthians Arena, earned R$2.67 million with tickets averaging R$62. In terms of overall gross income and attendance for the year so far, Palmeiras topped the list with an impressive gross income of R$18.4 million, with an average paid attendance of 30,285 per game. The Corinthians was a distant second at R$13.9 million and an average paid attendance of 25,655. Finally, Flamengo came in third with a gross income of R$11.8 million and an average paid attendance of 17,614 so far this year.